Annotation: Brighter Child(R) Fractions Flash Cards offer children a fun and easy way to practice their fraction skills. The set features 54 full-color cards with illustrations to help build meaning, as well as help children make comparisons. 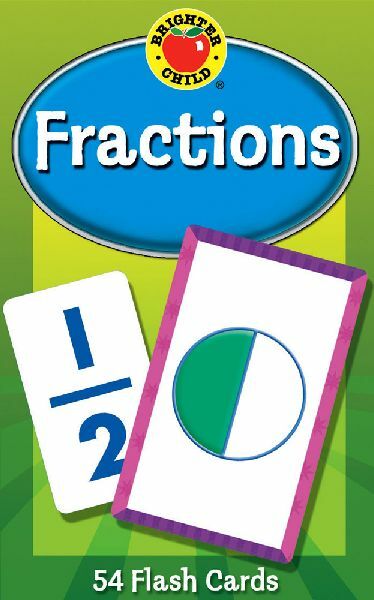 Each card covers basic fraction facts from 1/1 to 9/9, and a bonus card teaches basic mathematical symbols. A special card is also included and offers creative game ideas designed to reinforce learning. --The popular Brighter Child(R) Flash Cards give children a fun and easy way to practice important skills. Offering 24 titles encompassing preschool to grade 5, each title focuses on an important subject including early concepts, math, phonics, and U.S. History. Fun game ideas and learning suggestions are included to help children build proficiency and confidence. Game cards also allow children to develop thinking, decision-making, turn-taking, and social skills while playing fun games at the same time. --Select titles are also available in English-Spanish and Spanish-only versions.